Arguably one of the best twists this season was the introduction of Figgie, the female Biggie, who entered the house to rile and rattle the housemates with probing questions and mischievous remarks. The housemates had been getting a little too serious for her liking and she had plenty of fun yanking them out of their collective shells. After the initial shock, housemates grew to love Figgie. However, they were happy to have their beloved Biggie back, only to have Figgie come back one more time to unnerve them even more with an uncharacteristic serious streak. It's not all pleasure and pranks in the house, as Biggie always make it his mission to provide a platform not only for housemates, but also for important organisations and project such as ONE Africa. Housemates and Africa were given a new perspective on agriculture in Africa and last night saw Tayo become their new ambassador. During their special dinner they were treated to a ONE Africa Concert by talented African artists and tonight they were back on Biggie’s stage. 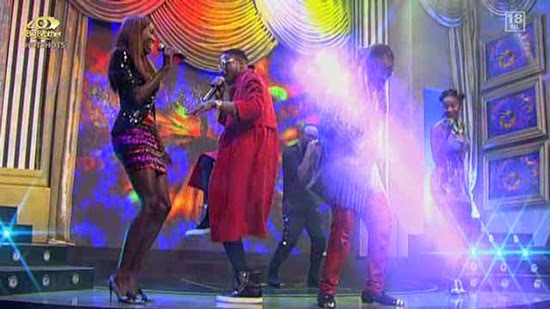 Buffalo Souljah, Vusi Nova, Nancy G, Wax Dey, D'Banj and Liz Ogumbo entertained and enlightened the audience with their performance of the ONE Campaign musical collaboration "Cocoa na Chocolate". Biggy, dis ojoro oooooo, Tayo should be the winner nt Idris. Haaaaa, so painful. Too late my fellow Naijerians. Idris deserve the money.